Through Selective Laser Sintering (SLS), rapid prototypes are produced from production materials. The parts typically have the highest strength. A CO2 laser sinters powdered material layer by layer to create a durable, solid object. The prototype can be used for functional testing in almost all applications including functional prototypes, electronic packaging, high-temperature components, snap fits, and living hinges because they are constructed from real engineering materials. When durability and/or high heat tolerance are required, SLS can produce parts which closely represent the physical properties of the production material. Considerably stronger than SLA; sometimes structurally-functional parts are possible. Laser beam selectively fuses powdered materials: Nylon, elastomers, and soon metal. 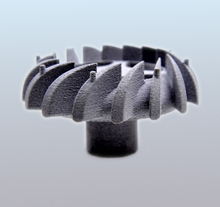 Advantage over SLA: The variety of materials, and the ability to approximate common engineering plastics. No milling step, so accuracy in z can suffer. Process is simple: No milling or masking steps are required. Living hinges are possible with the thermoplastic-like materials. The surface will be powdery and porous unless sealant is used. Sealant also strengthens the part. Uncured material is easily removed after a build by brushing or blowing it off.